Last year Gizmodo and the Museum of Science and Industry, Chicago partnered up to curate the technology for the Smart Home: Green + Wired. The exhibit recently re-opened for 2012 with new furnishings and a few our favorite new gadgets. MSI did an incredible job in 2011 creating a truly Smart Home that we wished we could live in, and this year's refresh is no different. GIZMODO at 2011 Smart Home - This is it! The exhibit isn't simply museum items behind glass; it's a livable and fully functioning house. Specifically, it was designed with a family of three in mind— two parents and an astronomy-obsessed 10-year-old. From its energy-efficient heated radiant subfloors and Low-E windows to its mechanized shading system and AMX automation system, the Smart Home is an embodiment of efficiency and intelligence. What's more, the 2012 Smart Home exhibit celebrates revival, featuring a whole new set of re-used and refurbished furnishings from Chicago home interior store Scout. This trifecta of ideals—efficiency, intelligence and revival—are illustrated in each room and aspect of the Smart Home. We love the house itself, but what we're most excited about are the new gadgets. In the kitchen resides the SousVide Supreme, a personal favorite amongst the home cooks at Gizmodo. Why do we love it? Because you can cook a steak with this machine, and it will be perfect every time. Using vacuum-sealed pouches, the SousVide cooks your food in a water oven held at a precise temperature for hours—sometimes even days—which translates to pure deliciousness. We labeled the SousVide as the microwave's high-tech successor, and for that we think it's smart enough for the prestigious countertop of this year's Smart Home exhibit. We outfitted the home office with a Lytro Camera. Let's be frank: This gadget feels like the future. It's not often we encounter technology that's really, truly new, and for us the Lytro cam—with its ability to focus pictures after they are taken—was just that. Alongside the Lytro Camera on the home office's desk we've got something magical, a haptic weather forecaster that lets you actually feel tomorrow's temperature. The Cryoscope designed by Robb Godshaw was created from a heat sink, cooling fan, and a Peltier element. All the parts are encased in an slick aluminum cube which heats up or cools down to reflect tomorrow's predicted air temperature. A simple web app lets you specify your location, and on the underside of the cube a red and blue colored LED provides a visual cue to the predicted temp. There are a few other gadgets we added to this year's Smart Home, but we don't want to spoil the surprise of seeing the exhibit in person. If you're in Chicago stop by the Museum of Science and Industry to see the 2012 Smart Home, but be warned they won't let you live in the house. We already tried. 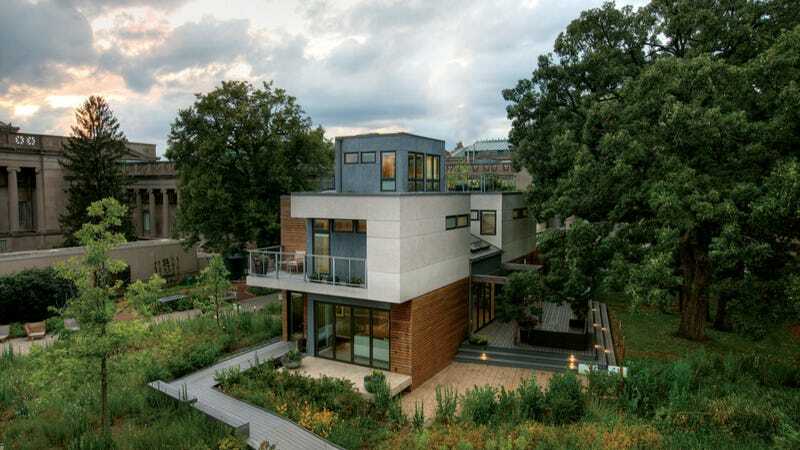 The 2012 Smart Home: Green + Wired exhibit runs from April 29, 2012 through January 6, 2013. You can find more information here about the 2012 Smart Home exhibit and MSI, Chicago.